And we are now in California! We are going to visit 5 ballparks in this state. Before heading to Los Angeles, we enjoyed the nice views of California. 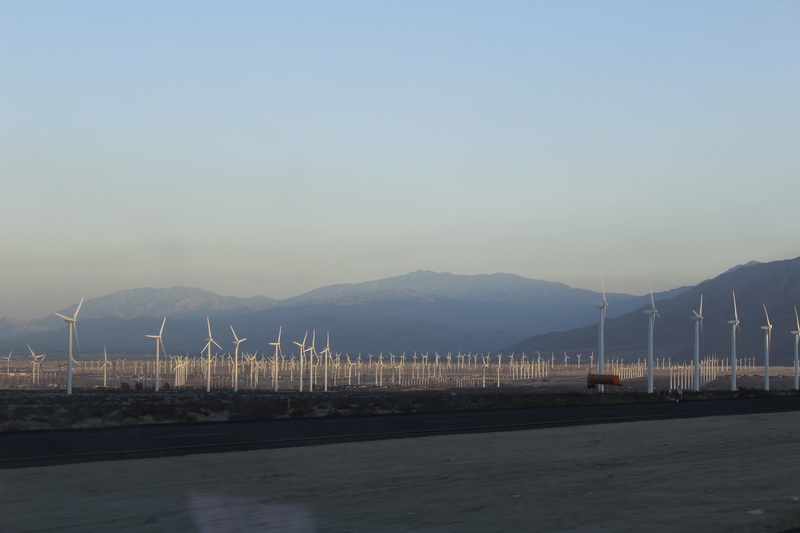 Everywhere we would go: mountains, valleys, windmill fields, etc. We decided to go through the famous: Joshua Tree Park. This national park is well known for being a place of inspiration for many people involved in the hippie movement and music groups. The park is home to a special kind of tree: Joshua tree. In this park, we also saw fields of a special cactus kind and breathtaking rock formations. We traveled through the park by car but there are several options: short and long hiking trail and natural climbing walls. Once again, we slept in a Wal-Mart parking lot. When we look at the United States map, we traveled a lot from east to west in the last few days! Next day was game day. We decided to take a chance and try to beat the Los Angeles traffic jams to go visit the city a little bit. 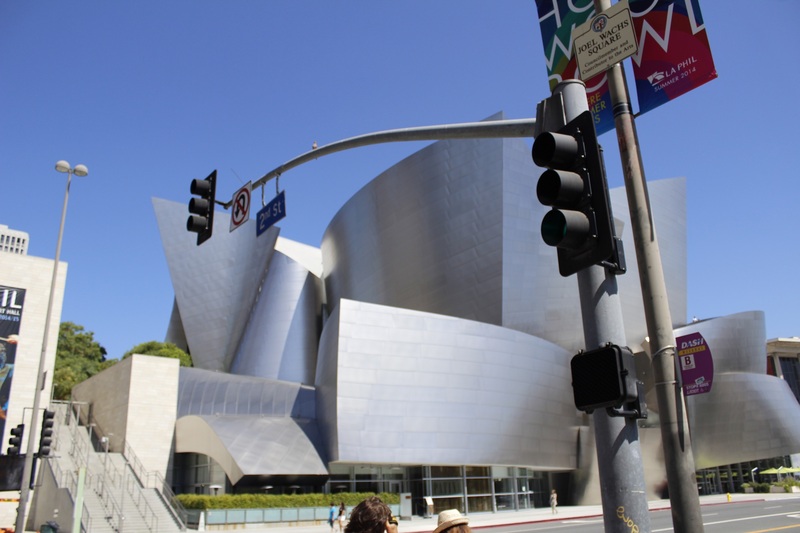 Our first stop was the Disney concert hall. It is a really well designed building. The audio guide is free and the one hour self-tour gives you great information about the building itself and its construction. 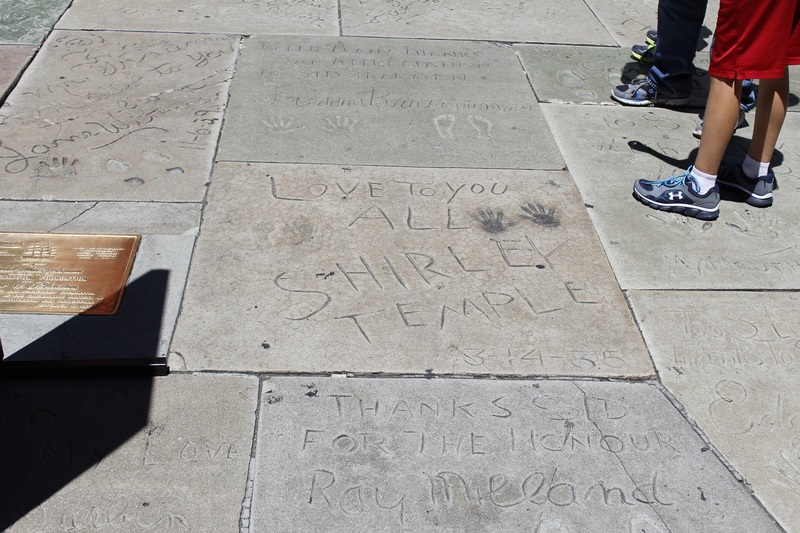 We then went into full tourist mode and went to the walk of fame to see the stars immortalized in the sidewalk: Michael Jackson, Elton John, Celine Dion, etc. After this typical visit of Los Angeles, we met up with my sister Elise and two of her friends who were all visiting California during their vacation. We already had bought tickets so we could all go to the game as a group to Dodger Stadium. 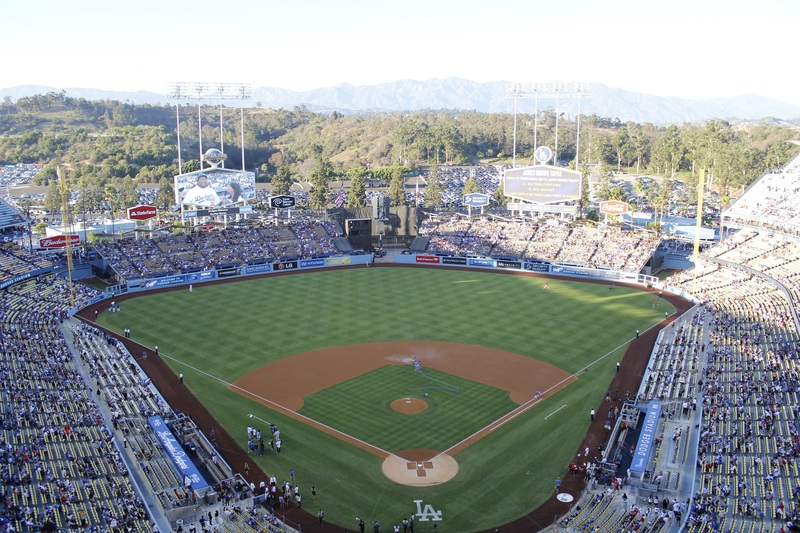 We have been told two things about the Dodger Stadium: first, don’t go there using the public transit and second, don’t go there and use the stadium parking lot! We still decided to go to the ballpark altogether in one car. We went really early to try and beat the traffic and so we could have enough time to visit. It was free hat day! We really are enjoying those kinds of promotions: it makes the fans happy and the tourists like us even happier! The first thing we realized out there was that the stadium is built in a mountain so we have to walk up a hill from the parking lot to get to the stadium entrances. Also, this is the first ballpark where we cannot enter the ballpark by any entrance. The ushers sent us to a different gate that would lead directly to the top of the ballpark. Inside the ballpark, it is really hard to walk around without getting lost: hallways that are leading nowhere, only a few places to access to the upper deck, etc. A real labyrinth! We have to say that the ballpark was built in 1962 (it is the third oldest in the league after Fenway Park and Wrigley Field). We understand that it might have been a big puzzle for architects to add sections and to renovate the ballpark. We still managed to do our usual ballpark tour. 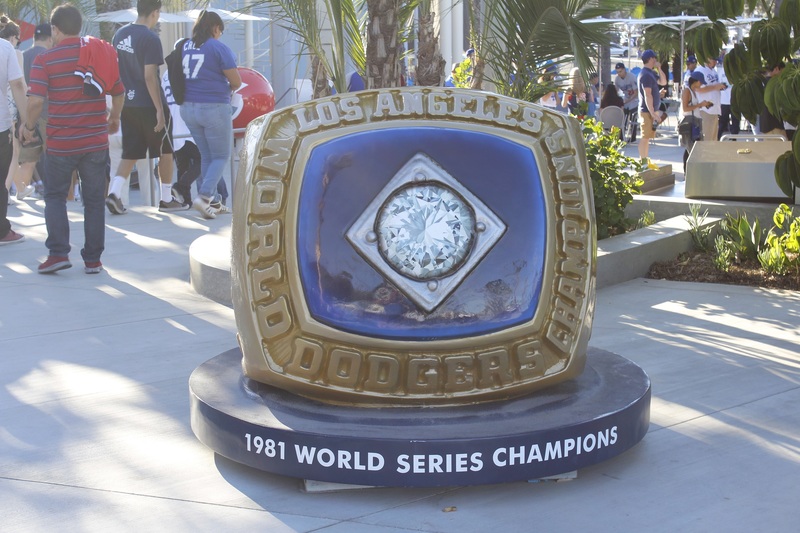 The dodgers are proudly showing giants replicas of their championships rings near an entrance gate (the 1981 ring was hard for us to look at). We really appreciated the different bar sections that have been added to the ballpark during the years. They are located outside the park so you can enjoy the nice weather with your beer. The bleachers section at Dodger stadium is a real one! Old school wooden seats and a great atmosphere can be found there. The Dodgers fans are well known to be intense but we’ll talk about it later. 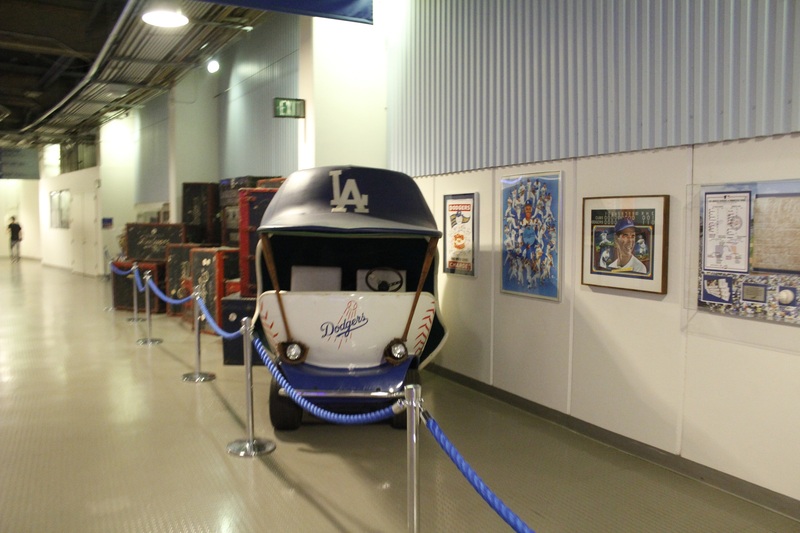 The Dodgers also created a section inside with World Series memorabilia, the famous ‘’bullpen car’’ (a cart that was used to bring the new pitchers from the bullpen to the mound) and various pictures and quotes from Vin Scully. Vin Scully has been the radio and TV analyst for the Dodgers for 65 years! This year, he announced that he will be back on the air for a 66th season. On the upper deck, you cannot miss the great view of Los Angeles downtown. A view that gets even more beautiful at sunset. You can also see the famous Hollywood sign in a distance. Also, the view behind center field is pretty nice. You can see the mountain and all the vegetation that lives there. We took a few moments to get an autograph from Matt Luke, a former Dodgers player, who took the time to listen to our project and gave us encouragement in the fulfillment of the project of getting a team back to Montreal. We have been told a lot about the Dodgers Dog. We don’t have the budget to taste every hot dog in every ballpark but we have to say that this one was particularly good. On the other side, the prices of the food and beer were really high. 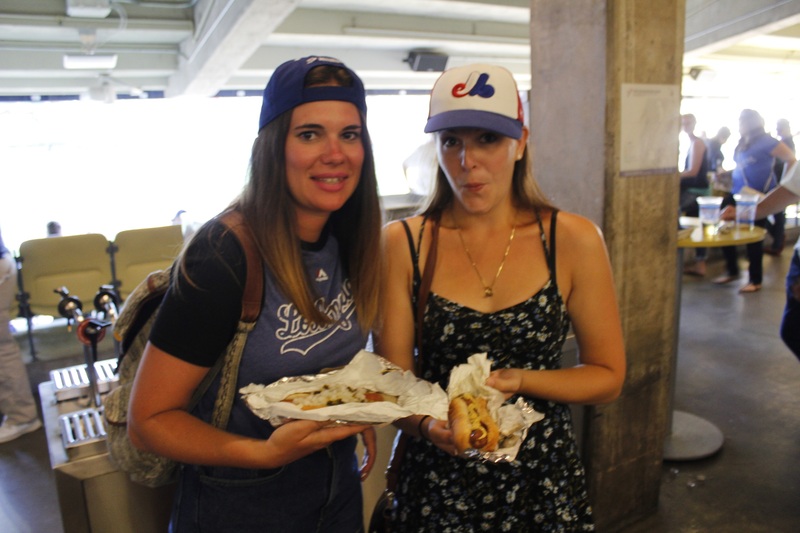 Everything is expensive at Dodger Stadium. 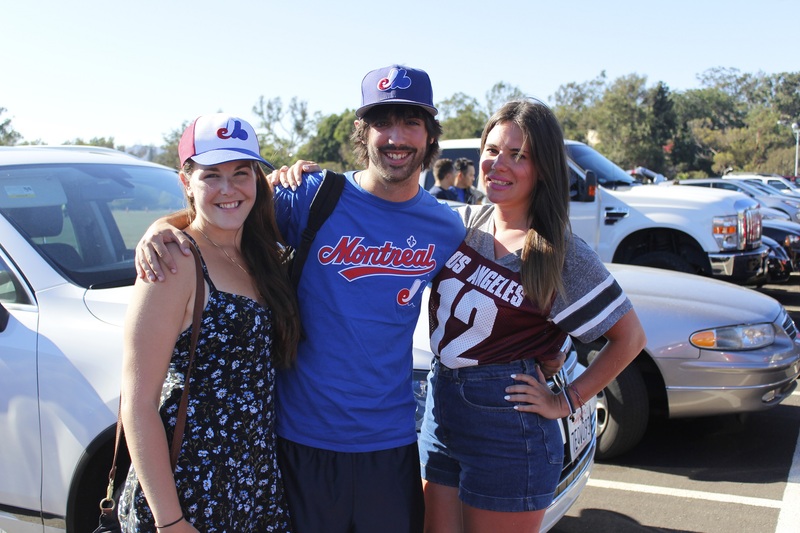 Before getting to our seats, we met up with Mike: a Dodgers supporter that moved to LA for four years now. Mike told us about the last owner of the Dodgers, Frank McCourt. He was the owner of the Dodgers form 2004 to 2012. He bought the team with loan money so he got the tickets and concessions prices raised to get some profits. After he declared bankruptcy for the team, the team was sold in 2012. Mike told us that a lot of fans were really angry about that McCourt era and some switched to the Angels fan base (they were having some good seasons). Mike told us that we should always be aware of who is buying the team if we eventually get a team back to Montreal. Mike was proudly wearing the Montreal Royal’s hat: farm team for the Brooklyn Dodgers was Jackie Robinson played his first season in ‘’white’’ baseball. Thanks to Mike for taking the time to talk with us! 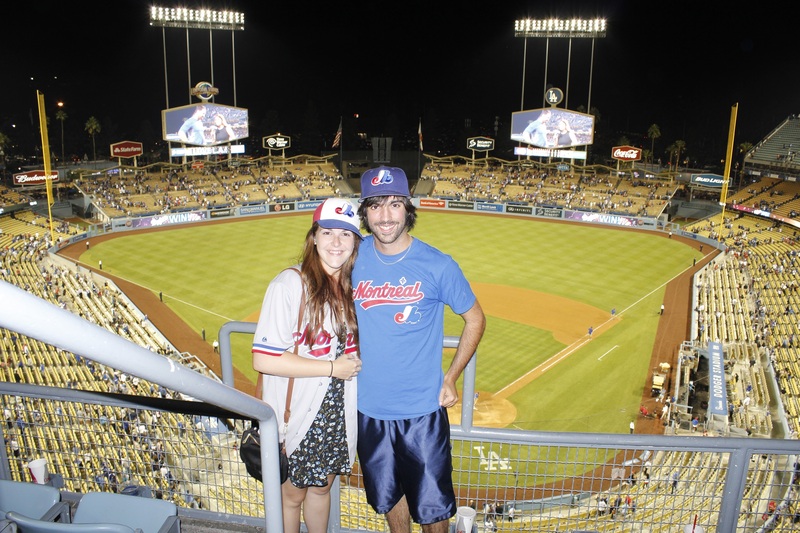 We went back to our seats so we could enjoy a nice inter leagues game: L.A. Dodgers vs L.A. Angels. The short distance between the two teams location was announcing a great game! We realized that the fans were getting really late to the ballpark after the first pitch: traffic jams on the L.A. roads weren’t helping. We saw that a lot of the Dodgers fan base is Latinos. The proportion of people of Hispanic or Latinos origin in L.A. is 47%. Those fans are really intense and are creating a great atmosphere in the ballpark. We have heard a few bad comments about the Dodgers fan base in general. We simply realized that they were really passionate with the team and we didn’t see anything wrong during the whole game coming from the fans. They encouraged the team during the whole game and we were really happy to cheer with them. They were 53,000 at the ballpark that night. For the game we had a duel between Clayton Kershaw (Dodgers) and Hector Santiago (Angels). Kershaw was trying to get his 14th win of the season. In the second inning, the Angels scored two runs on a Chris Iannetta double. Dodgers answered back right away with a 3 runs home run coming from Juan Uribe: 3-2 Dodgers. Angels tied the game in the third before the Dodgers took back the lead on a sacrifice fly. Who else but Albert Pujols with a home run (his 513th of his career) to tie the game again. 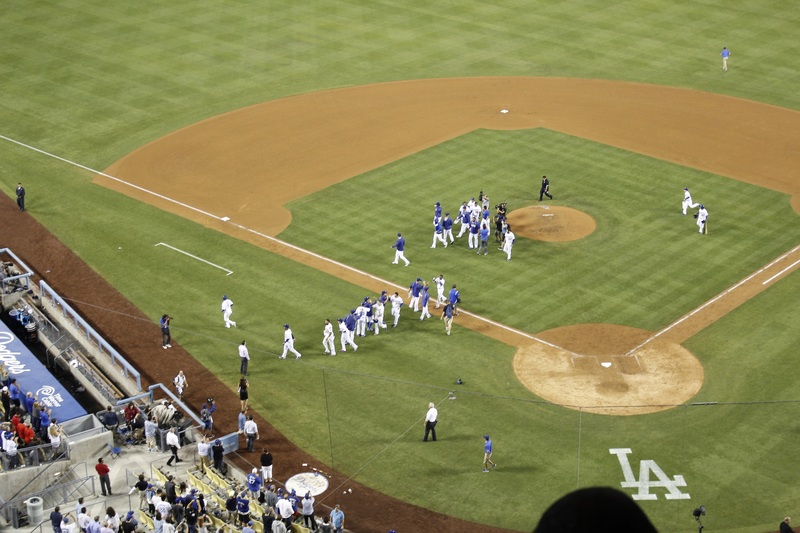 In the bottom of the 9th, with players on first and third, Andre Ethier came to the plate. He hit a fielder’s choice and a throwing error from David Freese let Juan Uribe score the winning run. Final score: Dodgers 5-4. 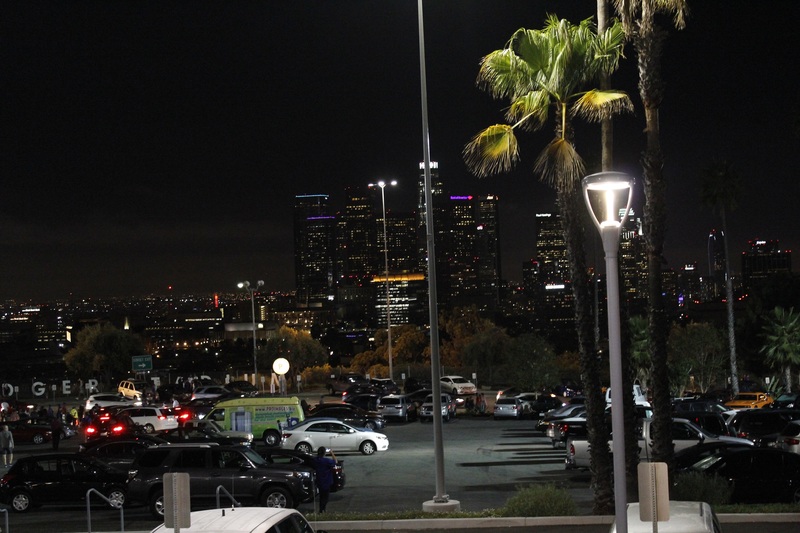 Leaving the ballpark (with a great night view of LA downtown) was a nightmare! First of all we couldn’t find the car in parking lot and second, everyone rushed to the few exit roads in total disorder. Everyone was blocked in the lot. 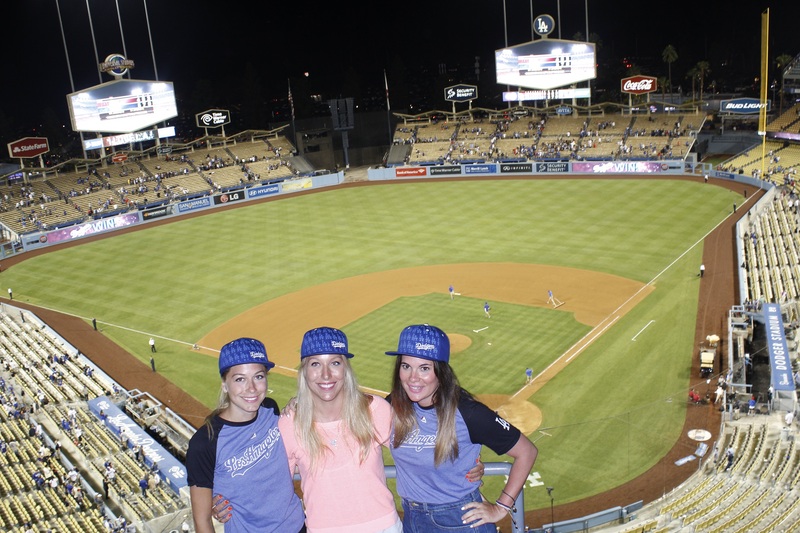 Yes we had a few struggle at Dodger Stadium but we could say that our experience out there was really good. The Dodgers fans were the most passionate fans we have yet to see in this trip. People will be loud during the whole game. We have to say that the team his having a good year. The fans out there are also buying a lot: gear, food, beer, etc. The lineups to get these were really long! 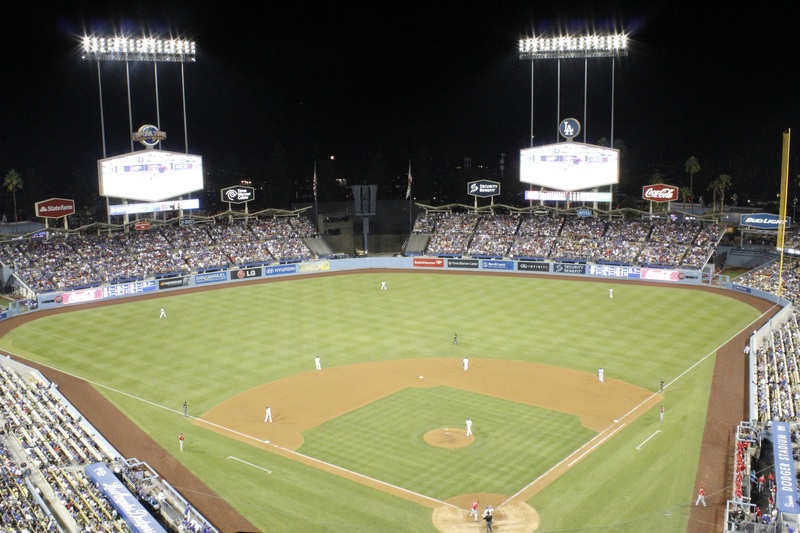 Los Angeles is the second largest city in the United States with a metropolitan population of 17 million people so we understand it is easier to attract more people to your ballpark. The team also as a rich history starting with the Brooklyn Dodgers. With 6 World Series and 21 National league pennants, the fans really have something to be proud of. 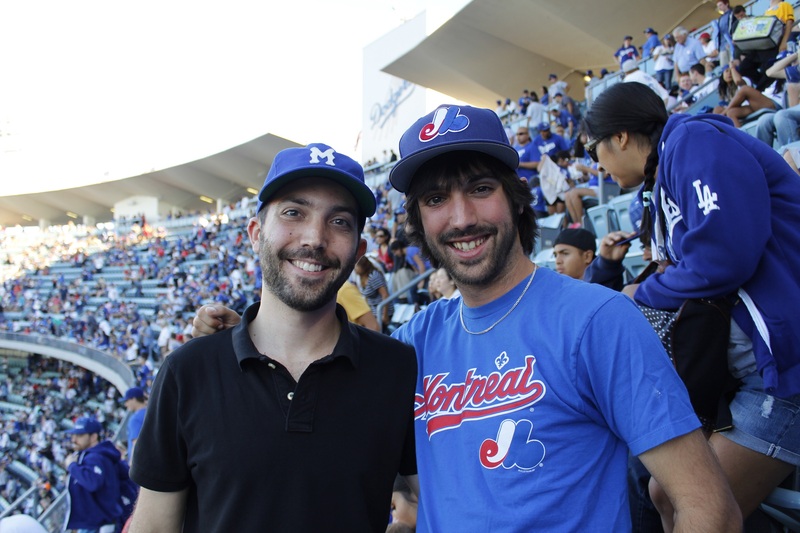 We really hope that one day we will be able to live the kind of experience and atmosphere we had at Dodger Stadium in Montreal. We cannot describe the vibe in the stands. We know that people in Montreal are really passionate so we do believe that this could happen with us. 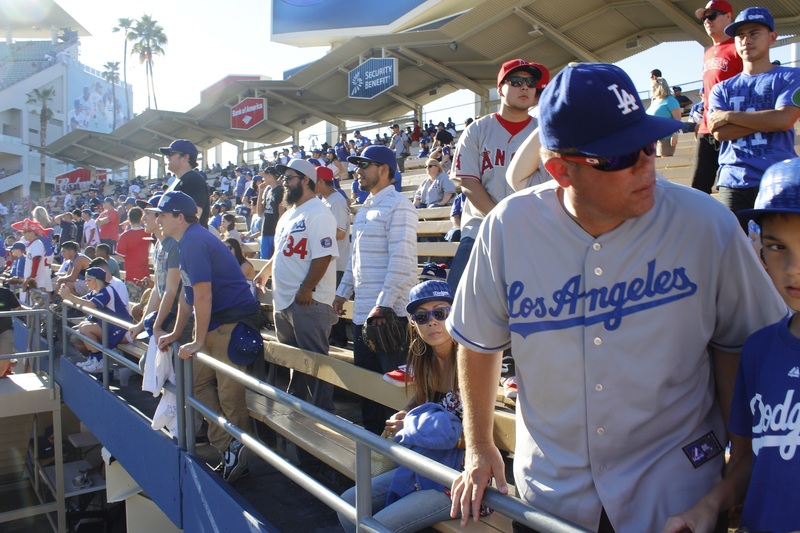 As long as we make sure that the stadium is easily accessible (especially with public transit) and that we have a god owner, we believe that the Dodgers have a missing piece of the puzzle in getting a new team to Montreal. 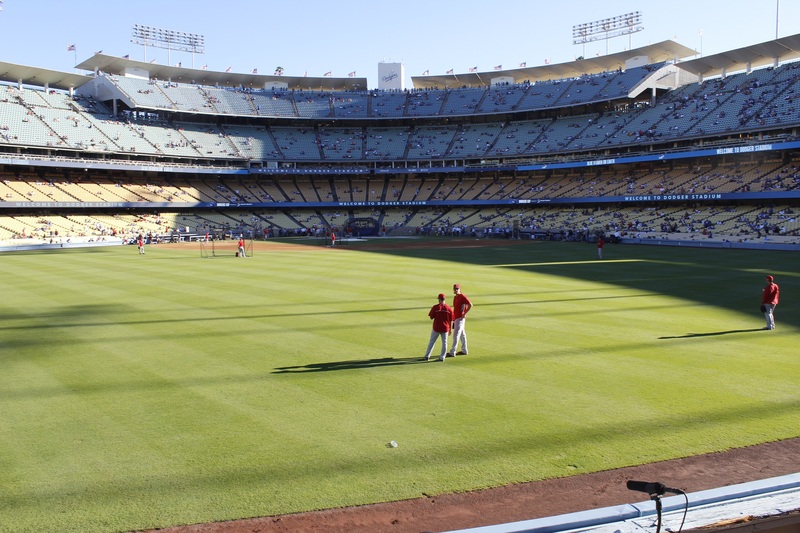 Next day we will be crossing the city to go to the Angel Stadium of Anaheim to see a game between the Angels and the Dodgers again! We can’t wait to compare! Thanks to Elise, Melissa and Sabrina that have accompanied us to the game. The more the merrier! Thank you also to Mike for taking the time to share some words on the Dodgers and the ballpark. P.S. Did you know that the name ‘’Dodgers’’ comes from people that were dodging the tramways in New York? Thank you Ken Burns! 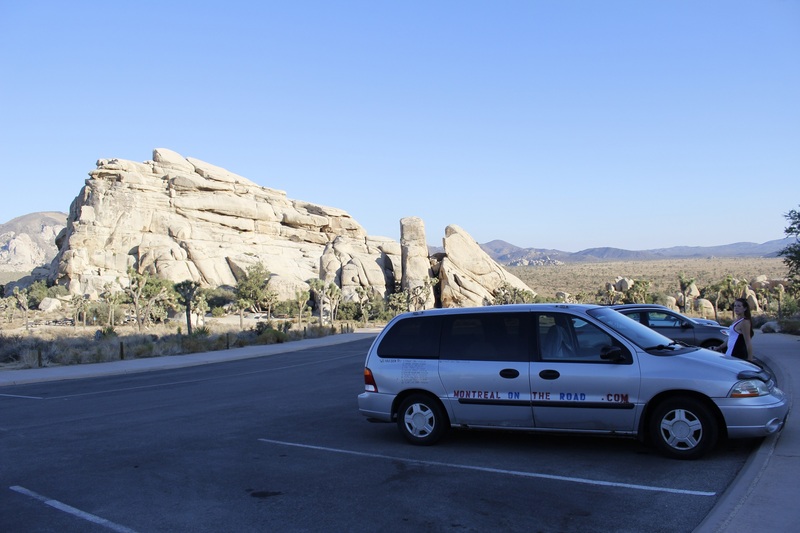 Isn’t Joshua Tree National Park amazing? 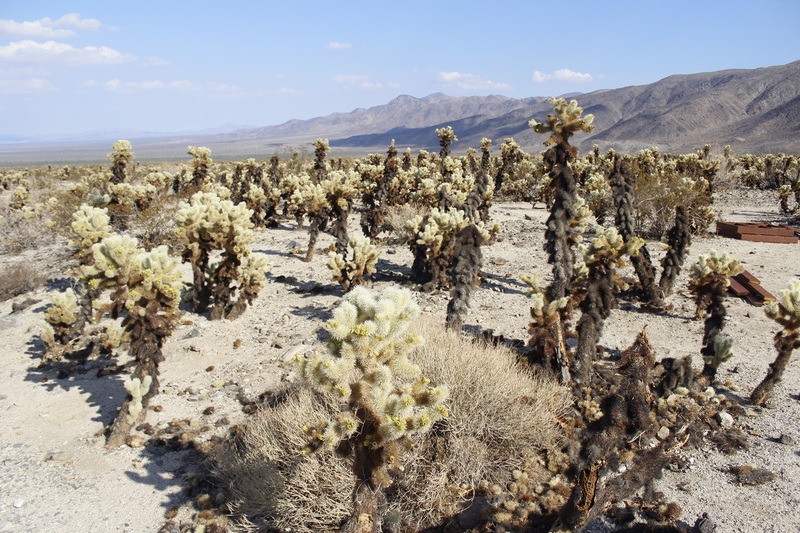 I have relatives that live just a few miles away from there, in Yucca Valley. I’ve been there twice. I’m sure you’re too young to remember “Blue Monday”. I’ll never forget it. Yes it’s amazing! We’re a little bit too young for that music but we can understand how the park can inspire the people!